DSV and Panalpina have agreed the terms and conditions of a combination to join forces with a Public Exchange Offer to all Panalpina shareholders. 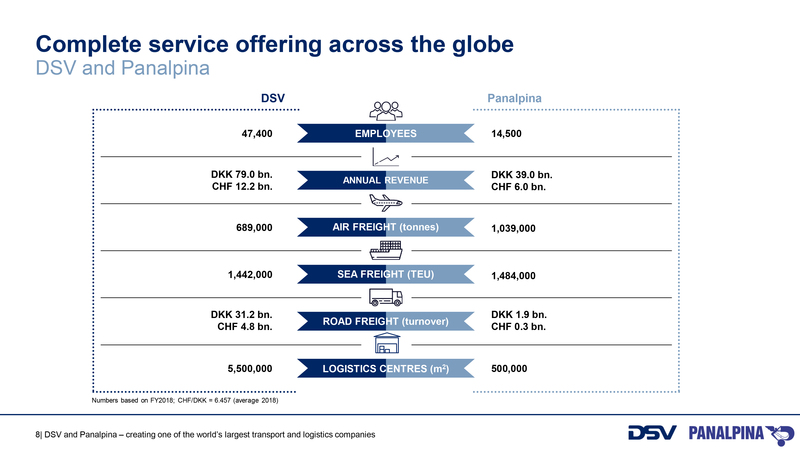 If the DSV offer of SFr195.8 for each Panalpina share is successful, a deal worth around $4.6bn, DSV and Panalpina will become one of the world’s largest transport and logistics companies with a pro forma revenue of approximately DKr118bn ($17.7bn)and a workforce of more than 60,000 employees operating in 90 countries. 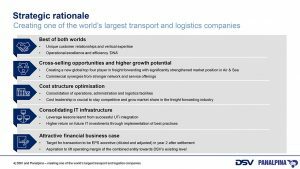 The Air & Sea division of the two logistics giants will be “substantially strengthened “and will be among the largest providers globally, with close to 3m containers (TEUs) and more than 1.5m tonnes of airfreight transported yearly. Following completion, DSV will propose to its shareholders, at an extraordinary general meeting, to change its name to “DSV Panalpina”, which “reflects the long, rich history of both companies”. 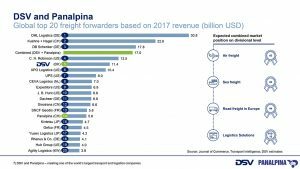 Kurt Larsen, chairman of the board of DSV, commented: “A combination of DSV and Panalpina further strengthens our position as a leading global freight forwarding company. “Together, we can present a strong global network and enhanced service offering to our clients, further solidifying our competitive edge in the industry. “It’s a great match on all parameters. Panalpina is a great company and we’re very excited by the possibility to join forces and to welcome Panalpina’s talented staff”. Peter Ulber, chairman of the board of Panalpina, said: “In the course of the past weeks, Panalpina’s board of directors and management have been exploring different strategic initiatives and held discussions with DSV about a potential combination. The Public Exchange Offer already has the support of shareholders representing 69.9% of the registered shares of Panalpina, who have “irrevocably agreed” to tender their shares into the Public Exchange Offer. This includes Panalpina’s largest shareholder, Ernst Göhner Foundation and Cevian and Artisan. The transaction has an enterprise value of approximately SFr4.6bn corresponding to DKr30.5bn on the basis of the closing price of DSV prior to the date of the announcement. Using the closing price of DSV prior to the date of this announcement, the Exchange Ratio represents a premium of approximately 43% to the on-exchange closing price of Panalpina shares on the Swiss stock exchange (SIX) of SFr137 on 15 January 2019, the day before DSV’s initial proposal was published. An integration committee comprising an equal number of Panalpina and DSV representatives will be established to oversee the integration process and ensure a fair treatment of all employees. “A thorough evaluation will be carried out with the aim to maintain relevant functions and competences in Switzerland”. At completion of the transaction Ernst Göhner Foundation is expected to become the largest shareholder of DSV with a holding of approximately 11% of the issued share capital. DSV has undertaken to nominate and recommend to its shareholders that a candidate proposed by Ernst Göhner Foundation will be elected to the board of directors of DSV. Ernst Göhner Foundation has undertaken not to sell or dispose of its DSV shares for a period of 24 months following settlement of the Public Exchange Offer, save for limited participation in share buy-back programmes that may be undertaken by DSV in the future. Thomas Gutzwiller, member of the board of trustees and chairman of the independent Panalpina committee of Ernst Göhner Foundation, commented: “In view of the ongoing industry consolidation and resulting opportunities and risks, we have carefully considered various options for Panalpina with an open mind. “Our Board of Trustees unanimously concluded that the proposed combination under the umbrella of DSV provides the best opportunities for Panalpina to meet future market challenges from a position of strength and to create value for all stakeholders. “As an entrepreneurial foundation with a philanthropic purpose, we feel very comfortable with the announced solution both in terms of quality and security as well as earnings potential. In this spirit of continuity Ernst Göhner Foundation looks forward to supporting DSV Panalpina as the largest shareholder.